Buying cheese can be a minefield, bewildering and intimidating. The labels are confusing as there are so many varieties of the same yet different cheeses. Not all of us are cheese fundis and many of us are unfamiliar with 'cheese speak'. Allow Back Chat to lead you through the maze of names and processes. We will research it together and you will become comfortable and relaxed about the whole cheese imbroglio. If you still have doubts or uncertainties or you just want to talk about cheese, do please contact me. Leave a comment on the blog, or email me at les@leslieback.co.za. I look forward to hearing from you. 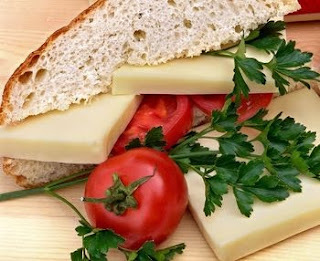 Cheese can be made from any milk, usually from cow's, goat's, sheep and water buffalo. In the Middle East they use mare’s milk and camel’s milk. There are no limitations on any mammal’s milk, other than quantity and availability. The basic principles of cheese making are the same for all cheeses. The object is to extract water from milk, leaving milk solids (fats, proteins, vitamins etc). To simplify the stages of a very complex process, it involves coagulating milk, treating curds, moulding, pressing and finishing the cheese and leaving it to ripen. At this stage there are many variations. From the biggest Commercial cheese makers to the smallest Artisan operation, the awareness of quality control is paramount. These controls are further tested by food and government controlled inspectors. Going back to the earliest livestock farmers allowed the milk to curdle, beating it with branches and pressing it on stones then drying it in the sun and sprinkling it with salt. This was a way of using valuable surplus milk and converting it into a food for lean times. By today’s standards of industrial technology, cheese making is a complicated process. There are big commercial cheese operations to satisfy the enormous worldwide demand. The smaller farmyard (artisan or artisinal) ventures are practised by craftsmen using traditional methods and considered preferable by aficionados. They maintain that cheeses manufactured from untreated milk are better than those made from pasteurized milk, a process used in the commercial operation. Pasteurization is named after Louis Pasteur,who originated the process. This is a way of partially sterilizing milk to destroy potentially harmful bacteria. It makes it possible to mix milk from different herds to allow for large-scale industrial cheese making. Cheese connoisseurs argue that this process destroys the individuality of cheese and makes a blander product. Nevertheless, most of cow’s milk cheese in the world today is pasteurized. The need to coagulate milk in order to make cheese has been recognized since Roman times by extracting the enzyme Rennet from certain plants. Cheese making capitalizes on the curdling of milk, which contains proteins, fat, lactose (milk sugars) and minerals. First the milk is carefully tested to make sure there are no harmful agents. The milk is heated, held at a given temperature for a short period to destroy any harmful bacteria i.e. pasteurization. Special starter cultures are then added to the warm milk and change a very small amount of the milk sugar into lactic acid. This acidifies the milk at a much faster rate and prepares it for the next stage. Rennet comes in different forms. An enzyme extracted from the stomach of a young calf or lamb. A non-animal rennet can also be used (kosher cheese), which is then added to the milk and within a short time a curd is produced. The curd is cubed and heated to start a shrinking process, which, with the steady production of lactic acid from the starter cultures will change into small rice-sized grains. At a carefully chosen point, the curd grains are allowed to fall to the bottom of the cheese vat. The left over liquid; water, milk sugar and albumen – now called Whey, is drained off. The curd grains mat together and form large slabs of curd. Later they are pressed and packed in various sized containers for maturing. HARD PRESSED CHEESES Hard cheeses are cooked, pressed and aged for a long period, usually about 2 years, until hard and dry. Among the more well known are Parmesan and Pecorino. SEMIFIRM CHEESES such as Cheddar, Edam and Jarlsberg are firm but not usually crumbly. They have been cooked and pressed but not aged as long as a hard pressed cheese. SEMISOFT CHEESES are pressed but can either be cooked or uncooked. They have a sliceable texture, but are soft. Gouda, Monterey Jack and Tilsit are among the more popular. SOFT RIPENED OR (SURFACE RIPENED) CHEESES are neither cooked nor pressed. They are sprayed or dipped which exposes them to various bacteria, ripening the cheese from outside in. These cheeses develop a rind that is powdery white (Brie) or a golden orange (Pont Lévequè). Their consistency is creamy to spreadable e.g. Camembert. BLUE VEINED CHEESE is a special process cheese, inoculated or sprayed with spores of the moulds (Penicillium Roqueforti or Penicillium Glaucum). They are punctured with holes to allow the mould to penetrate during the ageing period, producing cheeses with veins or pockets of this flavourful mould. The famous Roquefort and the English Stilton compete for the title of ‘King of Cheeses’. SPUN PASTE Another special process category is Pasta Filata, Italy’s famous stretched-curd cheese. Among the Pasta Filati cheeses are Mozzarella and Provolone. FETA CHEESE A classic Greek cheese traditionally made from sheep or goat's milk. Today large commercial producers use cows milk. As feta is stored and cured in its own salty whey brine, feta is often referred to as pickled cheese. White, crumbly and rindless, Feta is usually pressed into square or round cakes. It has a rich tangy flavour and contains form 45-60% milk fat and ranges in texture from soft to semi dry. For people who cannot tolerate cow's milk, goat's milk with a higher content of fatty acids is a more digestible alternative. BUFFALO MOZARELLA The history of Mozzarella is linked to the Water Buffalo and is made from whole buffalo milk. Porcelain white in colour, it is spherical in shape with a very thin edible rind and sold in single or multiple balls vacuum packed in brine. Undoubtedly Mozzarella made from buffalo milk has the most sublime texture. BRIE Acclaimed as one of the world’s great cheeses the French Brie is considered the finest. An edible downy white rind and a cream-coloured, buttery soft interior, which oozes at the peak of ripeness. WHEY CHEESES are another special category e.g. ricotta. RINDS The rind of a cheese is usually very distinctive. Fresh white cheeses have no rind at all. Most cheeses fall into one of four groups: dry natural, soft bloomy white, yellow red washed or artificial. Below is a table of the approximate percentages of chemical composition of the four most popular milk-producing mammals from which cheese is made. Milk from different species of mammals, when used for cheese manufacture, differs in chemical composition. The cheese gourmet considers artisinal (farmyard) cheeses a great taste experience. Indeed they are, when one can find them. These are cheeses made by craftsmen in a traditional way. Unpasteurized, but considered hygienic, Europeans have been eating raw milk cheese, as it is known, for generations. The danger of eating raw milk cheese is similar to eating raw oysters. Those people with a higher risk of infection should not eat raw cheese or oysters for that matter. Pregnant women should not eat raw cheese or oysters. If the animals have been in a field eating dandelions or lavender the finished cheese will have more flavour. The use of raw milk is becoming a rarity as more milk is being pasteurized. The United States and Denmark impose a blanket ban on unpasteurized cheese. The ban reduces the supply, but has little effect on the demand. Cheese lovers pay high prices for these which can be found at speciality cheese stores. The French have their wonderful fromageries where a wide choice remains. Firm, semi firm and semi soft cheese should be wrapped in an airtight bag and stored in the refrigerator’s cheese compartment. (If there is not one, create a space for cheese alone.) These can be stored for several weeks. Mould appearing on these may simply be cut away. Fresh and ripened cheese should be tightly wrapped and stored in the coldest part of the refrigerator, generally for no more than 2 weeks. Mould on these signals that the cheese should not be eaten. All cheeses taste better at room temperature. Prepare your cheese board well in advance and you will find your cheeses more sumptuous, but do lightly cover with wax paper. Firm and Semi firm cheeses are easier to grate if cold. Cheese & Wine are wonderful companions. A general rule is that light red wines are mostly served with soft cheeses that have downy rinds and with goat’s cheese and pressed cheeses. More robust wines are best with soft cheeses that have washed rinds and also veined cheeses. Goat’s milk cheese can also be served with dry fruity wines. Cooked and processed cheeses go well with a rosé. Blue cheese and Roquefort are perfect with a smooth white. Beer and cider are particularly suitable for drinking with more robust hard cheeses. It is essential to buy the right cheese for the event at hand. 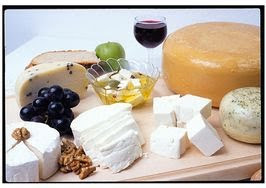 Cheese can be eaten as an appetizer or as in the United States, after the dessert. The French serve cheese after salad, but before the dessert. Enjoy it with crisp farmhouse bread, rye bread, biscuits or crackers. Actually with whatever you choose. It can be wonderful just on its own. There is controversy in France whether to butter the bread or not, as is the question whether the rind should be eaten or not. Experts are divided on both these points. Freshly cut cheese produces a finer flavour than pre-packed cheese cut form the same wheel and sealed in plastic – say aficionados. But for the privilege of having freshly cut cheese, you have to have a very good source, a store that specializes in cheese and slice wedges on demand. Check the sell-by date on pre-packed cheeses and buy only the most reputable and from a store that has a fast turnover.